We, Seth Industrial Corporation started in the years 1964 are one of the foremost manufacturers and exporters of an extensive array of E-Rickshaw and Bicycle. Our offered range consists of best grade Battery Operated E-Rickshaw, Super Kids Bicycle, and Teenager Bicycle. All offered ranges are made in conformity with the industry accepted standards of quality. Owing to their durability, sturdy design, and resistance to damage, these are appreciated among our patrons. Apart from this, we are offering these products at very reasonable rates in the market. Our infrastructure helps us in the attainment of all of the firm’s goals. For this, our facility has been equipped with the latest machinery and equipment. The well-equipped facilities help us in bringing excellence in the offered products. Additional to this, our reasonable pricing, customer-centric approach, and transparency in business are some of the key factors behind the success we have earned in the short period of time. Also, we deal in Neelam Brand name. Apart from this, our exporting countries are African Countries, Bangladesh, Egypt, and Nepal. Under the headship of our mentor Mr. Rajesh Seth, our organization is moving ahead in this domain. Owing to his excellent managerial skills, optimistic attitude and rich knowledge about this field, we have been proficient to carve a niche. Our UltraModern Plants, Labs That Gives us Strength, Sparkling Finish & Durability. "Quality is our most important mission"
We, Seth industrial corporation a pioneer company in the rickshaw kit market established in 1964 having 80% market share today and leader in this segment, has constantly come up with new trends in bicycle line with evolving consumer needs in mobility solution viz personal, public and various industries. An edge over other players and leaders in this segment is being maintained since then. Known best for its flagship brand "Neelam" SIC has created and perfected every new cycle category for every age and class of society in the country. In keeping with its visionary status, SIC proudly registered " Neelam" as the NEELAM trademark in the year 1967 as manufacturers. The trademark "Neelam" is priceless and a key element for success, reliability, quality, and adherence to business ethics in the full sense of the term. With the trademark, separate SIC not on separate identity but also enhanced the shine and glory of its emblem by developing various successful models of bicycles and rickshaw kits. We are a 9001:2008 certified company by Intertek, UK. SIC today is untouchable among the industry, which is really a wonder entity when seen from the level of achievements over the level of investment. SIC has maintained its growth trajectory both in turnover and profit by rolling out 12 lac bicycles and rickshaw kits per annum. Just not that's it! We are also anchored as the only in-house manufacturer of eight major bicycle parts on the count with the fervour and optimism for keeping at bay any Chinese part to make the bicycle functional. We have valid BIS certifications for bicycle frame-fork-mudguard and chain. The energy of SIC can be felt nationwide, thanks to the network of 500 primary dealers and 10000 secondary dealers. SIC not only achieved a level of success across the length and breadth of a country but also tested international water through export both direct and indirect spread over almost all continents. We have a synergy of latest technology, well-equipped machinery also have adopted innovation as the central driver for implementing its strategy and achieving growth by an R & D function. A total quality management approach has ensured a satisfied community of customers with " Neelam" as the preferred brand in all the markets The success is because of our dealer fraternity, business partners and vendors for their continued co-operation and support. The employees and workforce of the company are a great source of strength The journey thus far as possible with their dedicated service in building a stronger "Neelam" brand. SIC foundation rest upon four pillars of transparency - full disclosure - independent monitoring and fairness to all. Known best for its flagship brand “Neelam” SIC has created and perfected every new cycle category for every age & class of society in the country. In keeping with its visionary status, SIC proudly registered “Neelam” as trademark in the year 1967 as manufacturers. The trademark “Neelam” is priceless and a key element for success, reliability, quality and adherence to business ethics in the full sense of the term. With the trademark, SIC not only held separate identity but also enhanced the shine and glory of its emblem by developing various successful models of Bicycles & Rickshaw Kits. 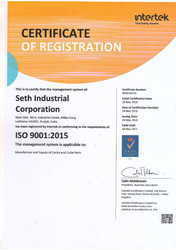 We are a 9001:2008 certified company by Intertek, UK. SIC today is untouchable among the industry, which is really a wonder entity when seen from the level of achievements over the level of investment. SIC has maintained its growth trajectory both in turnover and profit by rolling out 12 lac Bicycles & Rickshaw kits per annum. Just not that’s IT! We are also anchored as the only in-house manufacturer of eight major Bicycle parts on the count with the fervour and optimism for keeping at bay any Chinese part to make the bicycle functional. We have valid BIS certifications for Bicycle Frame – Fork – Mudguard and Chain. The energy of SIC can be felt nationwide, thanks to the network of 500 primary dealers and 10000 secondary dealers. SIC not only achieved a level of success across the length and breadth of the country but also tested international water through export both direct and indirect spread over almost all continents. 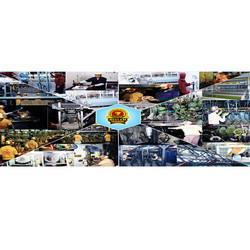 We have the synergy of latest technology, well-equipped machinery and also have adopted innovation as the central driver for implementing its strategy and achieving growth by an R & D function. A Total Quality Management approach has ensured a satisfied community of customers with “Neelam” as the preferred brand in all the markets. The success is because of our dealer fraternity, business partners and vendors for their continued co-operation and support. The employees and workforce of the company are a great source of strength. The journey thus far as possible with their dedicated service in building a stronger "Neelam" brand. SIC foundation rest upon four pillars of Transparency – Full disclosure – Independent monitoring and Fairness to all. Our firm has recruited a team of personnel, who have good knowledge in their respective fields. They work dedicatedly with the clients to know their precise need. Also, they make sure that the ordered products are timely delivered at the clients' end. In addition to this, our quality team checks the entire range of products on certain well-defined parameters.